NewsLetter is a free batch emailer, speciallly thought for newsletters. Its interface is very simple and intuitive, and it features the creation of plain text and HTML messages (simple or multipart), customization of subject and body using "smart tags" and attachments (including inline attachments in HTML messages). You can send the messages immediatelly, save them in MBOX format and place or send them through Entourage, as additional features. Here you see the main window. Where you see the word "drop" you must drop plain text files containing the pertinent info, usually output from regular databases, or import data from FileMaker using the related button. You can customize the subject and body of the message for every recipient using "smart tags". Just take a look to the documentation for a brief how-to. You can send html messages, so the look & feel of your messages fits your needs. Simply write the code or grab it from the frontmost page in your favorite browser (menu "Special"). When you are done, hit the "Preview" button and, if you're satisfied, the "Start" one. NewsLetter doesn't require additional software, appart from a standard installation of Mac OS X 10.4 in a MacIntel machine, so you don't take care about additional settings. All the needed stuff is bundled within the app itself, including the coolest applescript emailer agent ever known: XMail.osax, by JB Le Stang. OS X 10.4, Intel processor. This product is freeware, use it at your own risk, blah; XMail.osax was made by JB Le Stang. contacts was written by Shane Celis, used for faster access to the Address Book (if requested). You may not try contacting us about this product. But for feedback, suggestions, bugs, donations... Read the documentation (I spent some time writing it!) and, if needed, Mail us! License: This app works here so far, but may freeze your system, delete all files in your HD or whatever disasters you can imaginate. Make some tests before switching definitively to NewsLetter. - Fixed bug introduced in 2.8.1 regarding the "Send to Entourage" buttons. - Updated documentation regarding the "Create MBOX file" menu item. - Fixed little bug for some Panther-Intel users. 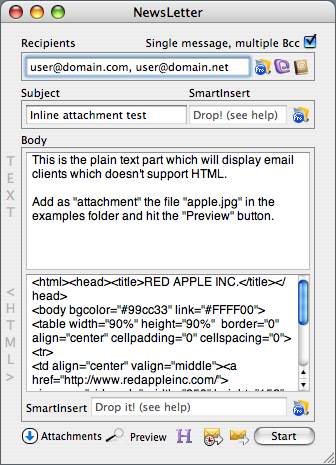 - Added sample NewsLetter automation applescript. - Fixed truncated email addresses coming from Address Book. - Fixed datestamp, now RFC2822 compliant. - Included Intel build of "contacts". - Added simple email address editor. - Manteinance release, no new addons. Since this version, Intel-only. Should fix the "Can't make data into..." bug in MacIntel machines (I received around 1k emails in the last year regarding this Intel-side-bug of NL, so it was time to defeat it before everyyone switches to Intel ;-). PPC users can work with v. 2.6.1. - Now bundles XMail 3.7 (UB). - I'll add new improvements ASAP (not very soon, though, due to overwork) --> email address editor in the pipeline. - Fixed issue with non-Entourage users. - Fixed issue with double-carriage-returns in plain text emails. - Changed email encoding to UTF-8 (read help docs for more info). - Updated documentation to reflect some important things. - Fixed minor bug with the progress bar. - Fixed minor UI bug with the attachments window. - Built as universal binary. - Extended filters for Entourage-import-addresses option. - Added SSL support and override port options (XMail upgrade) --> ie, gmail support. - Added strong email verification. It should be now much faster and accurate (uses now a perl script and a powerful regular expression). - Fixed various issues OS-related. - Fixed a bug importing from FMP 6. - Fixed a bug with the BCC recipients option enabled. - Added new scheduled newsletters .nls (see docs for NL automation). - Reworked .nlt document icon and added .nls one. - Better handling of mime types. - Bundled XMail 3.2, bug fixes and new features. - Bundled XMail 3,.1 much more robust and with new features. - Included cramsha1 authentication (XMail feature). - Automatic detection of mime types. - Unicode support in subject and plain text body. - Support for any kind of inline attachment: flash, sound, movies, etc. See the readme file regarding this feature. - Added support for FileMaker Developer and FileMaker 8. - Fixed compatibility issues with FileMaker 7. - Hopefully, the new XMail.osax 2.3 will fix crashes in certain machines when sending lots of messages. - Added an option to send BCC messages to groups of max recipients (should fix some issues sending emails to large lists). - Added a simple attachments-editor (you can view/add/delete them). - Added the capability to add extra headers. - Fixed error in preview function in docs with inline attachments. - Fixed important error with Bcc recipients. - Now, when you save or load a newsletter document, NL remembers its name and location (so you can "save" and "save as", instead of "export"). - Hopefully, random CRASHES in random machines have been FIXED, thanks to the help of Mikko Levanen. - Fixed a crash when opening newsletters with missing attachments. - Changed MIME method to multipart/related, which should be compatible with any email client. - Added drag & drop support for attachments. - Optimized routine to extract smart-tags from FileMaker. - Fixed the "check images" function. - Added an option to create a verbose log. - Now you can import smart-tags for both body and subject from FileMaker. - Added compatibility with FileMaker 7 and Entourage 2004 in all functions. - Added options to send messages through Entourage or place the composed messages at Entourage's Outbox folder. - Fixed issue with messages not showing properly in Mail. - Added an option to save messages in MBOX format, so you can preview them in Mail or Entourage/Outlook. - Switch to XMail.osax as mail agent: now NewsLetter will work for any smtp server, since it does support most known methods of authentication (old request of some affected users). - Added support for multipart emails: you can now send a mix of plain-text and html, plus inline attachments in html emails (request). - "Single message, multiple BCC" moved to main window, now is part of a "saved newsletter". - Reworked part of the code, optimized, reniced and better error handling. - Updated documentation. Added new examples. -Added the capability to export and import "newsletters". -Now you can import addresses from the Address Book selectivelly. -Now you can filter current email addresses based on filters. -NewsLetter no longer requires "encdec" to encode login data. -Little GUI and code renices. -Added the capability to preview messages in NewsLetter (no more switching to a browser). -Added the capability to grab email addresses from FileMaker, Address Book and Entourage. -Added the capability to export email addresses at any time. -Fixed ocassional issues with the help system and the preview function in systems without a user-defined default browser. -Added support for multiple attachments. -Added the option to check for invalid image urls in HTML messages (see docs). -Added the option to check for invalid and duplicate email addresses in recipients (see docs). -Better handling of possible user errors using smart tags. -Rework of documentation. Added a quick guide to create newsletters.